I can't believe how much better this has made my van. I thought it was labouring to start but it was just a tired old battery. This is an upgrade as well as new as I do lots of short trips. Excellent service,arrived next morning,just as promised,brilliant. Great service. Fitted to VW Transporter on a 08 plate. What a difference. Car starts quickly again. battery can start engine cold without radio cutting out. Let's hope it lasts. OEM battery lasted 8 years. Fast delivery (over Christmas!) and perfect product at the very best price! Have used Tayna for years, Excellent service. Fast delivery. Spot on every time. Excellent product. Terminal covers great for ensuring no accidental connections. Admitedly the handle is something you don't use very often but as I was fitting to a classic car needed to fit and remove several times. The handle clips into the down position and you need strong nails or a screwdriver to lever up. Minor design flaw really but a bit irritating. 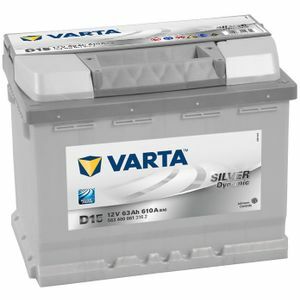 I've bought a number of Varta Silver batteries from Tayna over the years. Always an excellent service at the best price for a premium battery. Had to fit the battery clamp across the top of the battery (like a chin strap) rather than around the middle on my classic car as the battery walls are thinner than the original and probably wouldn't take the stress. Excellent service. Battery was exact match for the one in the car despite it being at least 5 years old. Arrived the next day. Batterie reçue rapidement et chargée à bloc. Embalage soigné afin d'éviter des surprises. Batterie de qualité qui tient bien dans le temps, pour preuve celle ci vient remplacer en préventif celle en place dans l'auto depuis 2010 avant d'avoir un souci. Varta très bonne marque et Tayna vendeur sérieux. It's a battery, it came quickly, I installed it, it worked. Bingo! Good value, arrived well-packaged. Could not find a way to establish date of manufacture (the OEM Varta battery it replaced had clear week/year stamp on terminal). Same battery as was on the car so fitted perfectly, very quick delivery and good price so I'm very happy with it. Battery came as described and quickly, I gave it an overnight charge before fitting, but I had no need to as it was already fully charged! Good price and service, definitely recommend.